Virgin Media TV customers in the UK, you can now watch your TiVo live television service or recorded programs on your Android device, anywhere! Anywhere with a WiFi connection, that is. Assuming that you've got a phone or tablet running Android 2.3 through 4.3, but not KitKat 4.4. Oh, and you can't be rooted. Have fun! All kidding aside, there seem to be some serious issues with Virgin's new TV Anywhere app for Android, starting with the aforesaid KitKat support. Other early reviews are decrying the lack of support for older, non-TiVo Virgin DVRs and the rooted device restriction, which American football fans can probably sympathize with. Others want to watch TV over the mobile network, and again, this is a common restriction when it comes to live TV streaming. Device support is spotty as well: the Nexus 5, Galaxy Nexus, and Galaxy S4 are showing as incompatible for me, though your results may vary. If you can get over all that, Virgin TV Anywhere offers a full program guide and remote recording, even when you're on 3G. The app also works as a basic remote for the TiVo box to make searching for shows easier. The interface isn't great, but it does at least follow the general look of the TiVo menus. Naturally you'll need to be a Virgin Media TV customer to log in to the app. Virgin Media is celebrating the Android app launch of Virgin TV Anywhere with the addition of nine extra channels to join the UK’s most comprehensive entertainment-anywhere service. They accompany an already unrivalled range of channels on Virgin TV Anywhere, which puts customers in control of their TV viewing and planning on mobile devices and online. Virgin TV Anywhere offers more live channels than Sky Go, with 90 available online and 67 to watch on mobile and tablets. 39 of these channels are not available on Sky Go, including BT Sport, ITV, Channel 5, CBS Reality Premier Sport and many more. Virgin TV Anywhere is the first provider to offer the full range of UKTV channels as part of a multiplatform deal, all nine new channels to join the service are Alibi, Dave, Drama, Good Food, Home, Really, Watch, Yesterday and CBS Reality. The Virgin TV Anywhere app is free to all Virgin Media TiVo® customers, taking advantage of Virgin Media’s cutting edge home entertainment and expertise in television, broadband and mobile to deliver an award winning* service that can be enjoyed wherever there is WiFi in the UK. The entertainment-anywhere service gives customers the ability to remotely manage their TiVo set-top box, including scheduling and deleting recordings in real time. The app also helps customers rate shows with TiVo’s trademark Thumbs Up/Down, see the recommendations TiVo has tailor-made for their household to watch and even acts as a touch/gesture-based remote control when at home. Customers can even sort out recording clashes by giving your favourite shows a higher priority to make sure they don’t miss them. 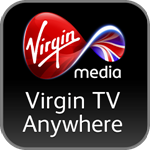 The Virgin TV Anywhere app is available across iPads, iPhones and iPod touches, and is now available to download from the Google Play Store. It is now compatible with a wide range of Android mobiles and tablets, including the Samsung Galaxy S4, HTC One, Sony Xperia Tablet Z, Google Nexus tablets and Samsung Galaxy Note with more Android devices joining the line-up in the very near future. Already boasting around 2,500 hours of content from the UK’s biggest on demand library for Virgin TV customers to enjoy on a computer, Virgin TV is working to replicate this service for mobile and tablet devices in the future.